Super Stun-N-Run is yet another superb "retro" 2D single-screen platformer from Natomic Studios, one of the world's finest game-coding groups. The plot: "The animals have gone wild!! You are Parker, a safari explorer armed with a stun gun, and it is your job to free the baby animals that are caged in each level of the island. Collect the keys any way that you can, and use your stun gun wisely." 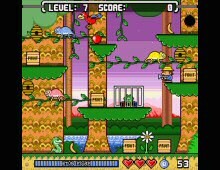 The island features 27 levels spanning three different areas. In addition, there are many bonus levels and "boss" fights that recall the best Nintendo games. Excellent graphics, fluid animations, and fun gameplay make this one of the most pleasant surprises from the freeware 'scene' in 2005. Highly recommended for arcade fans everywhere.